Bloomfire knows the value of content. The top community forum software vendor allows you to build an online community and engage with your colleagues and customers through knowledge sharing. We sat down with Craig Malloy, CEO and co-founder of Bloomfire, to discuss the ins and outs of how companies can get the most out of their community forum content both in-house and externally. The problem we’re solving is the following: workers spend an inordinate amount of time searching for the information they need. Studies have shown this to be at least 30% of their workday. The internet has made it a lot easier to find information outside your company, but what about within your company? The vast majority of what people need to know to do their jobs is most often found through self-discovery and connecting with peers, not through a formal training program. Knowledge sharing and connecting people is the essence of what Bloomfire does. Creating, capturing, displaying, saving and sharing information. It’s a problem every company faces to varying degrees. We want to be the place to go for all relevant content you need when you need it and the primary communication channel for notifications and collaboration. The original Bloomfire was founded in 2010, in Utah. 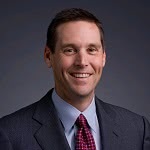 Dave McCann and I bought the company in 2011, after having used Bloomfire at our last company, Lifesize Communications. We now have 30 people in Austin, with well over 200 paid customers, ranging from small companies to large enterprises. What are the key components of your solution offering? We focus on four things. The first is storing and distributing information. 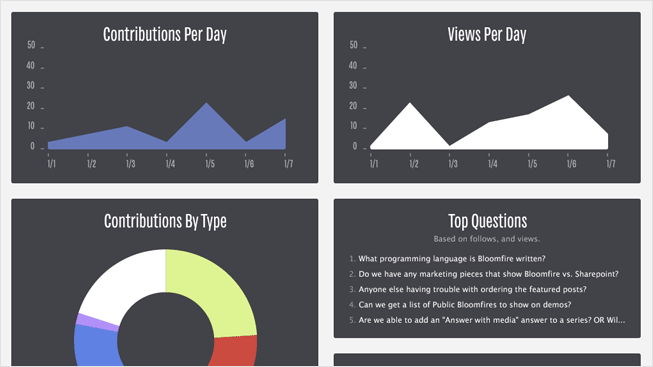 Everything that is posted to Bloomfire is visually displayed and categorized. We do document creation, co-authoring, webcam recordings, screencasts with audio, and more. We also offer searching and routing of content. 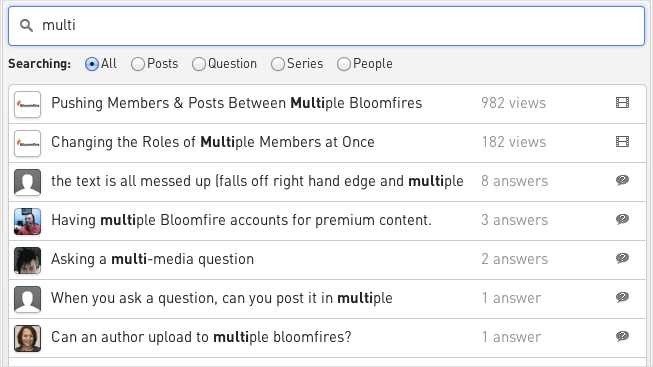 The third theme within Bloomfire revolves around asking and answering questions. We offer a very robust Q&A platform, where you can interact with your community and upload any type of content, including high-definition videos, spreadsheets, and more. Finally, we have an analytics engine to measure what content is being most used, who is posting the most, which questions are generating the most buzz, etc. How do people use Bloomfire? At least half of our customers use Bloomfire as a next generation social intranet/forum/knowledge base, which can be within a team, department, functional area or across the entire company. The second primary use case is sales enablement, which is a subset of the first use case. We deliver all the content that a sales team needs, whether they’re on the go or at their desks. The people that come to us from large enterprises typically are product managers, program managers, marketing managers, sales operations managers, training managers; in short, line of business persons that have a knowledge sharing problem with their team. It’s not someone who is generally trying to implement an enterprise-wide social network like Jive would do. Most of our communities start out at 25 users and $200/month and then scale up from there. In small companies, we typically talk to VPs or the CEO, who has a single workgroup that needs to share knowledge more broadly. What verticals do you target? It’s a mix. We try to let our customers dictate that to us. Our positioning is that the two primary use cases I mentioned earlier comprise about 90% of our business, so we focus on the use case more so than any specific vertical. Our solution offering touches various areas, from content management to enterprise social, so the number of use cases is vast. Social and the cloud have changed the way we do business. Do you see this trend continuing, and if so, in what shape or form? The notion of knowledge sharing tools is taking hold very quickly. There are lots of moving pieces and shifting boundaries as B2B learning, content management, file sharing, and enterprise social converge. The next one that is going to fall in that convergence is collaboration software, like web conferencing tools. Bloomfire is very well positioned to meet these demands, and we’ve been experiencing significant growth since the beginning of the year. Want more on community forum software? Browse additional blog posts, product reviews and the free top 10 report using Business-Software.com’s community forum resource page.